Does bluegrass music move your soul? Are you thrilled by the sight of racing Thoroughbreds? Are you excited to tour a bourbon distillery? Our tour of this remarkable corner of the country begins in Louisville, Kentucky, famous for Thoroughbreds, bourbon, and baseball! We’ll stay two nights in this thriving city and enjoy visits to Churchill Downs, the Kentucky Derby Museum, and Old Louisville, a historic neighborhood that hosts the largest concentration of Victorian mansions in the Unites States. You’ll also have the choice between visiting the Louisville Slugger Museum and Factory to learn all about our nation’s favorite pastime, or the Frazier Kentucky History Museum, with its new Spirit of Kentucky exhibit, the official start of the Bourbon Trail. The next day, we’ll travel to Lexington, stopping at Buffalo Trace on the way to explore the oldest continuously operating bourbon distiller in America. We’ll also visit the first town in Kentucky to be founded by a railroad. And, of course, we’ll see lots of horses here in horse country and even visit a horse farm for a first-hand experience of these majestic creatures. We’ll make our way south, stopping in Berea, known as the arts and crafts center of Kentucky, where we’ll meet artisans as they demonstrate their craft. After lunch at Boone Tavern, we’ll travel to Gatlinburg via the Daniel Boone National Forest, named, of course, for the iconic American pioneer who blazed a trail through these rugged, wild lands. Gatlinburg is the gateway to the Great Smoky Mountains! 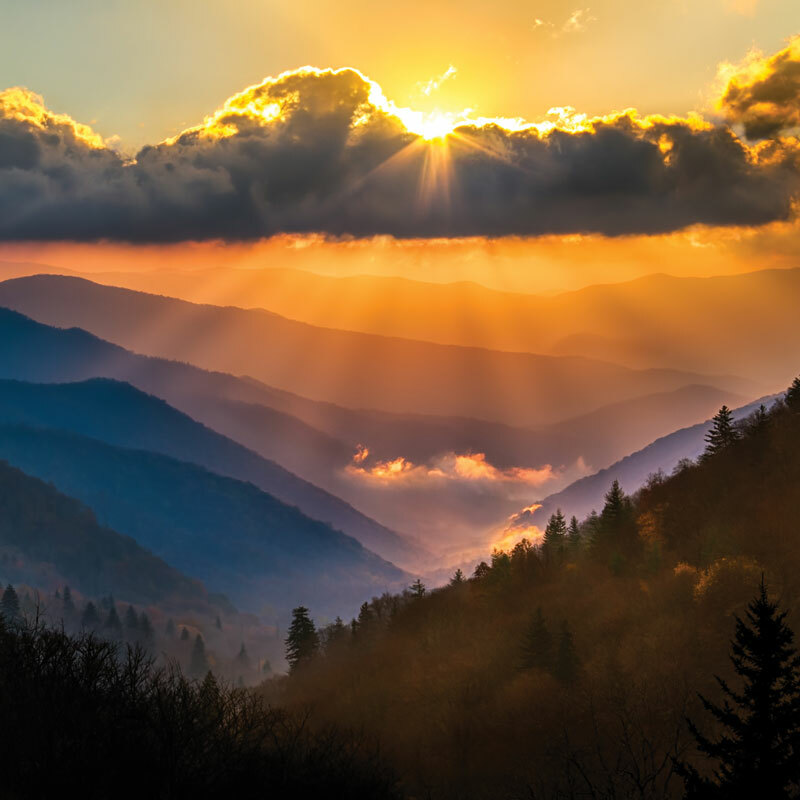 We’ll take a tour of the Great Smoky Mountains National Park, a UNESCO World Heritage site, which serves as home to one of Earth’s most diverse ecosystems and the largest deciduous forest in eastern United Sates. Our ultimate destination here? Newfound Gap, which boasts views of both sides of the Smoky Mountains. Later, we’ll enjoy a tour and tasting at the Ole Smoky Moonshine Distillery, and that night, we’ll be treated to the lively Dolly Parton’s Stampede Dinner Show for music, dancing, and professional equestrians performing incredible stunts on horseback. The next day, you decide how to spend your day of leisure! Maybe you want to revisit the Great Smoky Mountains National Park. Or perhaps you’d like to head to Pigeon Forge and experience Dollywood for all things Dolly Parton! Nest stop—Asheville, North Carolina! We’ll explore this quaint, artsy city nestled in the Blue Ridge Mountains before heading to the Biltmore Estate, a sprawling mansion and manicured grounds built by George Vanderbilt II, who wanted “a little mountain escape.” We’ll enjoy a wine-tasting at the historic Biltmore Winery while imagining we are still in the Gilded Age of America. Later, we’ll enjoy a farewell dinner at a local restaurant and fly home the next day, infused with the sights, sounds, and smells of America’s Southeast.